This is Elvis Presley Live at Greensboro, North Carolina, USA, on the 14th April 1972. I am not an Elvis aficionado, probably not even up to amateur standard, by any Elvis Presley fans measurement criteria. I do not impersonate him though, surely this gets me some street credibility back ? I tried to get some background on this concert and failed miserably. I know Elvis toured in 1972, he sold out Madison Square Gardens for four consecutive nights, and a video of him touring won a Golden Globe for best documentary that year. What is curious for me, is that the very limited notes that accompanied this concert say it was his first performance of 'Burning Love' on stage. This was released in 1972 and was his last top ten hit in the U.S. single charts, so from that perspective there is a little bit of Elvis history here. This is Kraftwerk live at the Hammersmith Odeon, London, on the 3rd July 1981. This is one of those annoying 'I was there' posts, yep that may be me somewhere in the crowd cheering, applauding or yelping, and why not, it was one of the best live concerts I have ever attended - not a comment I make lightly! Everything about them was refreshing. Ralf Hutter's occasional ad lib's and his sheer intensity at times as he sung. The use of electronic drum pads, and the whole tightness & rhythm of the band. The simpler & very different lighting for that period, a generous helping of neon would you believe? The uncanny resembling dummies, or was that robots? Letting the audience join in during the encore using handheld devices (circa pocket calculator). I first got hold of this particular concert recording a few months back, because I thought my dad would appreciate it. What surprised me, was how much I enjoyed it myself ! I know very little about Frank Sinatra's music, beyond what I heard being played around my home as I grew up. It was a generation gap thing. OK this was the sixties, a long time ago. Enough about my personal Sinatra growing up thing. This is a really good concert musically and sound quality wise. I find it a little bizarre, that according to some mainstream websites, this is still considered a rarity, and yet I obtained it without effort, whatever the case, here it is! Also known as Acoustic Masterpieces, I am very pleased to be able to share the Esher demos from 1968. These were recorded in late May 1968, at the home of George Harrison, and how is this for detail, his home was Kinfauns, a bungalow-style house, located at 16 Claremont Drive, Esher, Surrey, England, KT10 9LU, on the Claremont Estate, and only a short drive from the homes of John Lennon (Kenwood) and Ringo Starr (Sunny Heights). These demo recordings would eventually develop, with a few exceptions, into 'The White Album'. (Seven of the actual demos also appear on The Beatles Anthology, Vol. 3). They were made on George Harrison's Ampex four-track reel-to-reel tape recorder. The songs are performed by John, George and Paul, recording some of the material, they had written during their time in India, along with other recent numbers. 3. Child Of Nature (eventually Jealous Guy on Imagine). I try and share really good quality boots, (unless the material is very collectible) I am really pleased with the sheer audio quality of this one. This particular bootleg, is mainly known as Route 66, live in LA and PA.
Humble Pie originally formed in 1969, and had a large and loyal fan base right through to calling it a day in 1975. 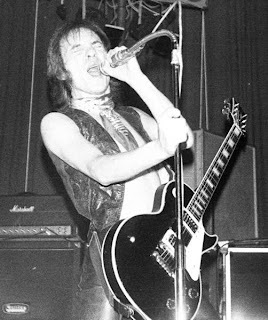 In 1980 founder Steve Marriott revived Humble Pie with former drummer Jerry Shirley, adding Bob Tench (from Jeff Beck Group) on guitar and Anthony "Sooty" Jones on bass. Two albums were released 'On To Victory', and 'Go For The Throat', however the 'second' Humble Pie called it a day by 1982. The tour(s) supporting these two albums became known as the 'Route 66' era, and despite the short lived reformation, the band were really good in concert, probably because Humble Pie were always a live band first. This is Humble Pie - Route Sixty Six.